Even when Muse's baroque, flamboyant rock is indisputably daft, as on the cod-Orwellian Citizen Erased, or chaos-theory anthem Hurricanes, you boggle at its preposterous elan. Why See Not So Silent Night - Muse, Florence and the Machine, Death Cab For Cutie? 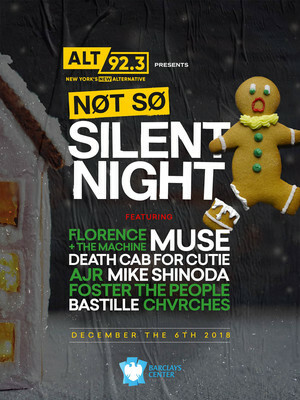 New York's home of alternative music on the radio waves Alt 92.3 presents their Christmas concert spectacular 'Not So Silent Night' at Brooklyn's Barclays Center, December 6th 2018. The festive one-night-only show features hard-rocking headliners Muse and the soaring sounds of Florence + the Machine, as well as music from emotional indie pop outfit Death Cab For Cutie, Foster The People, Bastille, Chvrches, AJR and Lincoln Park co-founder Mike Shinoda. 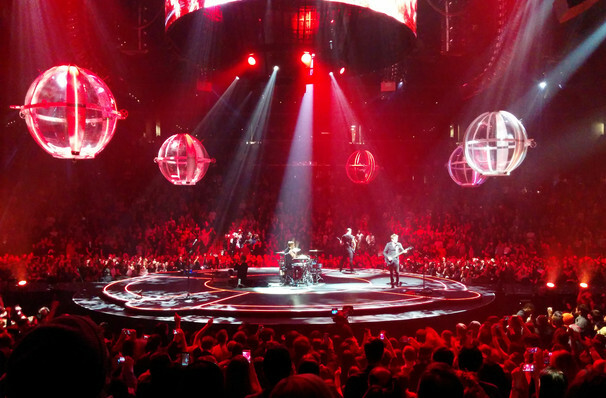 Since their debut album Showbiz first introduced the world to frontman Matt Bellamy's theatrical falsetto vocal style in 1999, Muse has earned a reputation for putting on one powerhouse of a show, filled with flaming riffs, pounding drums, retina-burning light displays and mass audience sing-alongs. One of the biggest bands in the business, the English trio have a whopping two Grammys, two Brit, eight NME and an Ivor Novello under their belts, having sold over 20 million albums internationally. With the hotly anticipated release of their 8th studio album Simulation Theory on the horizon, Muse are gearing up for yet another year of exciting fresh material and relentless touring. Sound good to you? Share this page on social media and let your friends know about Not So Silent Night - Muse, Florence and the Machine, Death Cab For Cutie at Barclays Center. Please note: The term Barclays Center and/or Not So Silent Night - Muse, Florence and the Machine, Death Cab For Cutie as well as all associated graphics, logos, and/or other trademarks, tradenames or copyrights are the property of the Barclays Center and/or Not So Silent Night - Muse, Florence and the Machine, Death Cab For Cutie and are used herein for factual descriptive purposes only. We are in no way associated with or authorized by the Barclays Center and/or Not So Silent Night - Muse, Florence and the Machine, Death Cab For Cutie and neither that entity nor any of its affiliates have licensed or endorsed us to sell tickets, goods and or services in conjunction with their events.